Easygoing yet elegant, the Starburst Oval Dining Table from the Inmod Signature Collection is set to take center stage in dining décor! A stellar option for larger spaces, the Starburst Oval Dining Table is crafted in top-quality oak, each with a low-key yet luminous finish. 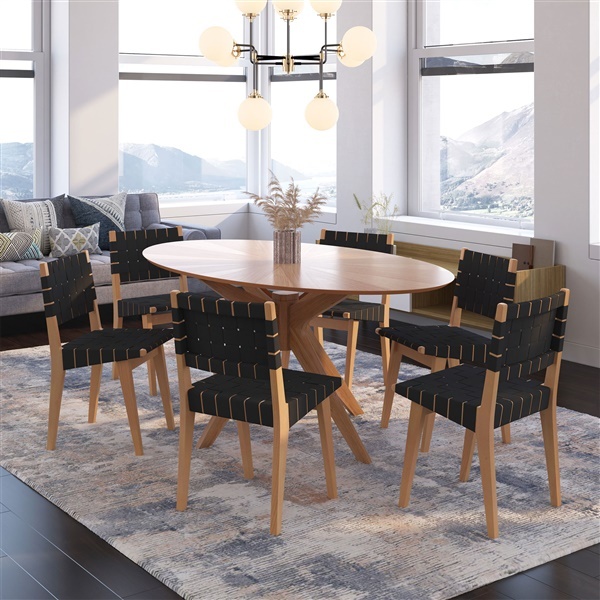 Featuring just enough eye-catching appeal with subtle yet shining detail, the Starburst Oval Dining Table features a stable base with an elegant yet edgy angular aesthetic that is easy to incorporate with several styles of seating, spanning the spectrum from somewhat classic to super-modern. Win, win for me. Look at the legs on this table - so beautiful. The email from Inmod said 2-3 weeks before arrival, but it arrived in less than 2 weeks in pristine condition. A beautiful oval shape, easily seats 6, & the wood & workmanship is of the highest quality. I smile every time I walk through my dining room & look at it. Such a pretty table! Love the look! 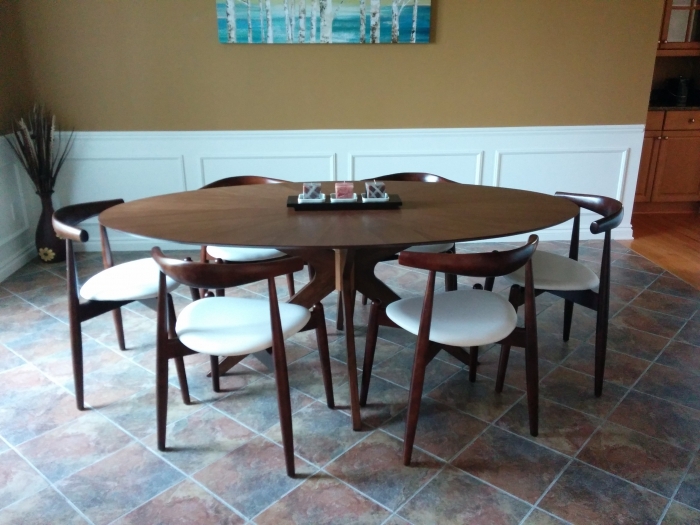 This table looks great in my dining room with my mod chairs. I love the starburst top. It looks just like the pics..true to the walnut finish and the starburst is just right. It is good quality and not cheap looking unlike some furniture you may order online. You can easily fit 6 chairs with it. love shopping at inmod <3 loyal fan! I can't get enough of Inmod!! Everything i've ordered from here including this table has been fairly priced, easy to assemble, looks just like the photos if not better and very attractive with a unique style - thanks again! Totally measured my dining room wrong and got the dimensions off, the table is too large for the space because I didn't factor in the dining chairs when they were actually pulled out - it is still doable it just doesn't leave a lot of room for people to walk behind the dining chairs when others are seated in them - the table itself is exactly the style i wanted so i refuse to return but it is a slight inconvenience - i recommend it just double check the space you're working with!! Even more stunning in person! I rarely see oval tops on dining tables anymore and with the star shaped base, it brings a new and interesting style to my dining room. Never seem to go wrong when ordering from Inmod - thanks again! Tremendously attractive design! Starburst design above and star shape below looks incredible! I love how beautiful it looks in my dining room! Spacious table top, sturdy base, well-made and ultra modern design! I couldn't have asked for a better table! Thank you! Fiance and I spent weeks searching and disputing the decision of which table to purchase for our newly renovated home. Finally we stumbled upon this piece of art, agreed immediately. So satisfied with the outcome. The "starburst" pattern on this table is STUNNING. I have it in the oak and it is the center focal point of my dining room. I have 6 chairs around it and I couldn't be happier. Such a unique design. ProsPattern is gorgeous and it's very well made. Glad I chose this. I love the table! It looks beautiful. The only thing is it isn't solid wood. Scratches a little easier than I would like, but it's extremely stylish. Love this table, high quality wood and looks very stylish! Would the 75â€ table fit 8 seats around the table? The Starburst Oval Dining Table comfortably seats 6 chairs around the table. 8 chairs can fit around the table, but it would be a tight fit, and the chairs would not be able to be tucked in. Is this table scratch resistant and water resistant? While the table does have a protective finish on it, we do still recommend wiping up any spills immediately, and using pot holders and trivets when serving hot dishes, to prolong the life of your table. One of your reviewers sites "not solid wood." What does this mean? The table top of the Starburst Oval Dining Table is made of MDF, with a wood veneer. The legs of the table are constructed of solid wood. 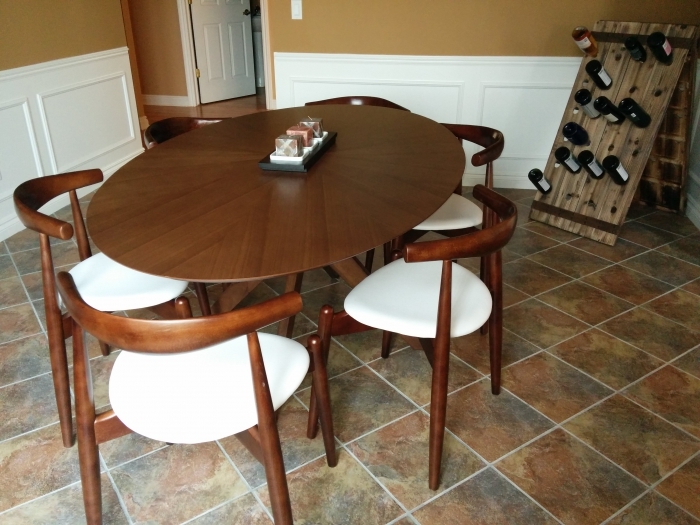 Are the natural oak Eden chairs in one of the pictures of this table available for purchase? Unfortunately the Eden Chairs are no longer available.